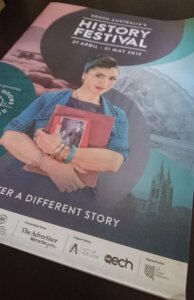 The official launch took place, the program is online, the program guides sent out, so it’s not long now until the 2019 South Australian History Festival. Every year is BIG, but even before this one has begun, the organisers have announced that this year’s history month is officaly the BIGGEST EVER, with 700 events, from 400 organisers. The giant program that is jam-packed with events, covering all corners of the State, there’s oodles for the genealogy and history buff (and even those not so much into history) to enjoy. South Australia’s History Festival normally runs for the whole month of May, however this year it actually starts a little early beginning with the Open Doors Weekend on April 27-29, and for that weekend alone there’s a choice of 50 events on, so good luck choosing. During May you will find tours galore (bus tours, guided walking tours, self-guided tours, even ghost tours), open days, seminars, displays, exhibitions, workshops and so much more … even an escape room! So there really is something for everyone. Archives, Genealogy and History Societies, Heritage Groups, Museums, Councils, Churches, Visitor Centres, Libraries, Primary Schools, National Trust branches and so many more organisations have been involved in organising events, the range of what is on offer is phenomenal. For the family historian (and even if you are yet to start, but are interested), there’s numerous events being held. You can check out the list of Family History events here. The full program can be viewed online, or you can pick up a printed copy from numerous organisations around South Australia, including our shop at Ridgehaven. With the online version you can narrow it down by event type, by region, or by date to see what is on. And as they’ve released the program schedule already, it gives you time to the plan ahead and book in to events you’d like to go to. But don’t leave it too log, as events do book out. So what are you waiting for? Clear your schedule for May, and get out there and discover more of South Australia’s history! Get social: For the latest happenings follow the SA History Festival on Facebook and Instagram. And remember when posting about it, use the hashtag #SAHistoryFest. NextDid Your Ancestors Arrive in 1839 on the ‘David Clark’ Ship?